Liquids can be milk, soy milk, almond or cashew nut milk, yogurt. Fruits or/both vegetables of your choice. Good fat – peanut or other nut butters, coconut oil, avocado. 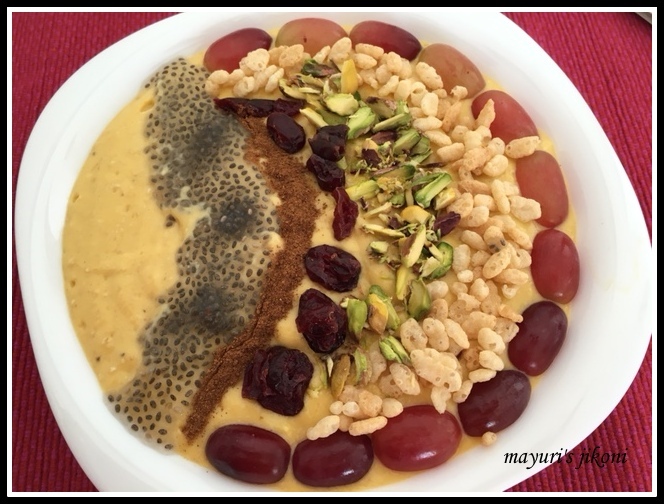 Thickener – yogurt, chia seeds, oats, banana, avocado, mango etc. Check out the ingredients that went into my smoothie bowl. Peel and chop the banana and add into a blender. Add peanut butter, mango, milk and oats. Take the smoothie out into a bowl. If you prefer, at this stage can chill it for 30 minutes. Decorate with the topping and serve. Vary the fruits, seeds and thickeners. I prefer to soak the chia seeds in water for 30 minutes. If you don’t have time to do that in the morning, soak them at night. Love the addition of peanut butter. Looks so filling!! Hi Mayuri,This is really healthy and yummy recipe. Thanks Rafeeda, it was really thick, no way could have had it with a straw. Thanks Veena. Peanut butter certainly made it taste different. Thanks Priya for the wonderful ingredients. It worked well. Thanks Sadhna. Will certainly post a few recipes. This smoothie bowl looks delicious and very tasty . I love the presentation.